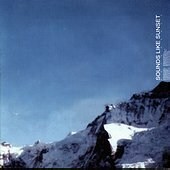 Sounds Like Sunset's Saturdays (released in 2001 on Modular Recordings) was a stunning debut. The Australian quartet, which has been around since 1998, managed to create a record loaded with atmosphere and swirling sensory overloads, while staying true to a melodic guitar-rock base. Front man Dave Challinor, who handles vocals, guitar, and songwriting duties, first contacted me in the summer of 2002, shortly after In Music We Trust Records released fellow Australian indie rock band Knievel's U.S. debut, The Name Rings A Bell That Drowns Out Your Voice. I was instantly taken away by Challinor's voice, and his ability to sweep you off your feet with a falsetto and send shivers up your spine when he gets agitated. The music also blew me away. The band could write catchy, should-be rock radio mainstays one moment, and the next minute they'd be caressing you with pillowy pop songs. I instantly wrote Challinor back after receiving a package from in the mail and we began trading e-mails. A review of Saturdays followed. But there was more I wanted to do for the band. So I asked Challinor if he could answer a few questions for me, and he did. Back and forth went the e-mails as we hammered out an interview. "I guess it just comes from when we were young, at school or whatever, and as the weeks drag on, every kid feels like Saturday is just the best day of the week, the day you crave for," Challinor says, explaining the album's title. The band is currently working on the follow-up to Saturdays, working at a studio in town while Challinor works on building a home studio to record all future albums. "I found this small 2-inch 24 track studio that is really dirt cheap. Other studios we've been in are in the cool, seedier parts of the city or whatever, near food, pubs, etc. But they're just so expensive and sometimes it's hard to feel relaxed enough in that sort of an environment to play the songs without tensing up too much," Challinor says. "It's funny, because this place we're at now only operates during the day. It's upstairs in a half-empty building surrounded by factories, train lines, and the main highway north out of the city," he tells me, "and the guy barely charges any more than what most rehearsal studios around here charge. We're just using the guy's knowledge of the equipment so we can create whatever we want. It's been a lot of fun so far and there's no pressure." Challinor says he enjoys recording and working in the current studio, but ideally would love to have his own home studio to record the band whenever he wants. He says he is nearly half way through building his home studio, a studio he hopes to record other bands in once it is up and running. "I have a great 2-inch 16 track tape machine here, which has been sitting under the house unused now for almost a year," jokes Challinor. "Some friends who work in studios are helping to source some gear for me, but it's pretty slow going, getting all these things together. I've been using a little Tascam Porta03 4-track cassette machine for about 9-10 years so I think it's about time to make the logical step up." In the year and a half since the release of Saturdays, Challinor and company have been busy writing new material, working on as many songs as they can to pick the best batch to record for the follow-up. Though it is slow going at times, Challinor hopes that the effort will pay off and demonstrate the band's growth and maturity since the release of Saturdays. "I have heaps and heaps of songs ready to record but we don't all know them as a band," Challinor elaborates. "We all live a fair way away from each other now so we don't really get together that often to practice. We've already done five songs, and I'd say we'd record at least another 10-15 before we decide on what's gonna be on the album. I have around 40 or 50 little songs on Dictaphone tapes and on the 4-track but I guess we'll just keep going until we have enough stuff that works well together, or until we run out of money." "Having said that though," Challinor continues, "it's been ages since Saturdays came out so I'm hoping we can release two or three things this year whether they be albums, EPs or whatever." Content just going with the flow, Challinor goes on to tell me that "there's no real plan, we don't have any management or anyone cracking the whip so if it's down to us we'll probably just release whatever we can, whenever it feels right." The new album will explore "music a lot more" as the band is "more in control of the sounds [they] want to get." "We haven't had to make the compromises that we had to when we did Saturdays, and I think we know more about what we want to achieve this time," ponders Challinor. "Then again," he adds, "it's probably more of a case of knowing what we want to avoid." Challinor and I then start discussing Saturdays in relation to their forthcoming sophomore release, something Challinor is more than willing to do. He's quick to point out that Saturdays was a good learning tool for Sounds Like Sunset to take its sound to the next level. "Saturdays was great for what we wanted at the time," he confesses. "Last time around we were kinda turned off by so many bands releasing stuff with this whole radio-friendly sheen to them, so we wanted to go for a more honest, rough-sounding thing. 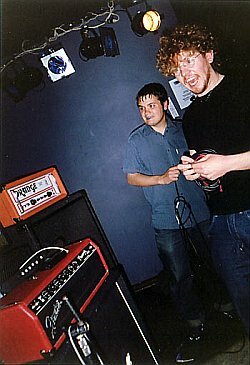 Initially we had a whole album of hi-fi versions of the songs, recorded and mixed in a fancy studio. But in the end, the tracks we chose to put on Saturdays came from everywhere - a loose collection of songs off 4 track tapes, digital 8 track, and other stuff was from reel to reel 8 track. At the time it just seemed more interesting for us than releasing some slick, note-perfect CD, you know? It was partially due to not knowing much about how all the gear in the studios worked, but at the time it just sounded more musical to us. "This time around we're a bit more clued in with how to make the most of a studio, so without necessarily being hi-fi it's probably going to be a lot more sonically aggressive and contain a lot more contrast." The album is as-of-yet untitled ("I have a hard enough time naming the songs without trying to name an album too!" laughs Challinor), and the band is without a label, but they plan to release the record in Australia one way or another in the summer or fall. The band also hopes to land record deals outside of Australia, as their next big goal is to expand outside of their homeland and make a name for themselves in other countries. "We love it here but there's only so far a band can go when they play this little scene over and over. I guess the thing we're most interested in is to try to get our records out overseas so more people can hear what we're on about."